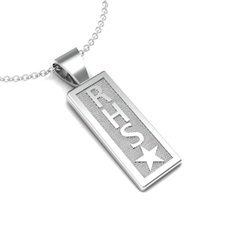 Chose one of three lettering to make your statement on this elegant rectangular pendant, beautifully crafted in platinum, palladium, gold or sterling silver. Dress it up with a decorative symbol or gem if you like. Monogram Format: With a vertical presentation of a monogram, we present the letters in a First name initial, Middle name initial, Last name initial layout. For example, Amy Rose Howell would be presented as ARH. View your monogram in the Gianni style. Spacer & Birthstone Options: Spacers and birthstones are optional. If one chosen, it will be placed below the last character in your personalization. Spacer choices are heart, star, cross, Star of David, flower or a birthstone.View spacer options and birthstone selection.